Approximate Shipping Weight: 4-5 Boxes total weight 250 lbs. The Method 5 Cateco Sampling Train is similar to the Method 5 train except that it replaces the Modular Sample Unit with a more versatile Cateco Heated Filter Unit. Separating the probe and heated filter from the glassware makes this train ideal for testing vertical and hard to access locations. 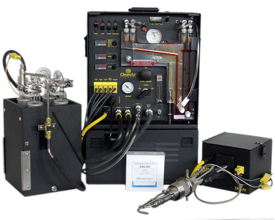 The Clean Air Cateco Method 5 Train is suited to perform isokinetic particulate testing Referencing Federal EPA 40 CFR 60, Appendix A, Method 5 -"Determination of Particulate Emissions From Stationary Sources." Other pollutants can be collected in the impinger portion of the system providing the proper reagent is utilized. Many components of the Cateco Method 5 Train are also basic equipment for several other EPA Reference Methods. Ask your Clean Air Express customer Service Representative for details about the accessories needed to perform Methods 4, 5, 6, 8, 8A, 5I, 17, 23, 26, and 29. For more information on this method, please visit the EPA's CFR 40 website.